00:11:00 Makes 1 serving, 2 quesadillas (170 g). Makes 1 serving, 2 quesadillas (170 g). These grilled tortillas, oozing with melted cheese, are sure to hit the spot. Heat barbecue to medium heat. Spread tortillas with Miracle Whip; sprinkle with chili powder. Cook quesadilla in nonstick skillet on top of the stove instead of on the barbecue. 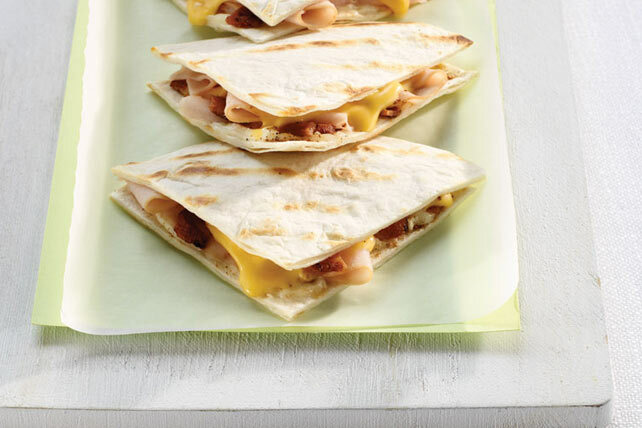 Serving Size Makes 1 serving, 2 quesadillas (170 g).